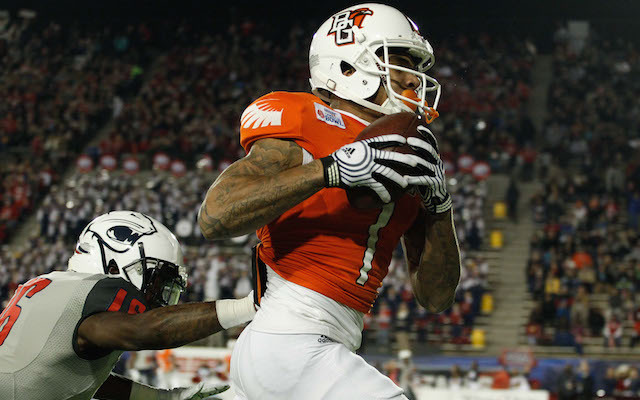 Bowling Green freshman receiver Roger Lewis had TD catches of 44 and 78 yards to lead the Falcons past South Alabama in the Camellia Bowl. The Camellia Bowl in Birmingham, Alabama featured the Bowling Green Falcons from the MAC Conference vs. the South Alabama Jaguars from the Sun Belt conference. This was almost like a home game for the Jaguars, who only had to travel 250 miles to Birmingham. Both teams came limping into this game. The Jaguars had lost 4 out of their last 5 games and had a 6-6 record. The Falcons had lost 3 in a row and had a 7-6 record. After forcing a punt on the first series of the game, Bowling Green quickly got the momentum. They scored on their first offensive possession on a 44 yard pass from redshirt freshman QB James Knapke to freshman receiver Roger Lewis. After forcing another Jaguar punt, the Falcons drove 93 yards in 9 plays and redshirt sophomore running back Travis Greene dove over from a yard out to put Bowling Green up 14-0. South Alabama fought right back on their next possession. Senior running back Kendall Houston scored on a 44 yard run to cut the deficit to 14-7. Midway through the 2nd quarter the Falcons extended their lead by marching 56 yards in 14 plays. The drive stalled at the Jaguar 21 yard line and they connected on a 21 yard field go to go up 17-7. Just before halftime, Bowling Green added another field goal to take a 20-7 lead into the locker room. In the 1st half, South Alabama senior quarterback Brandon Bridge struggled, but he turned things around in the 2nd half. Midway through the 3rd quarter, he led his team 52 yards in 9 plays for a touchdown to cut into the Bowling Green lead. Bridge ran it in from 15 yards out and all of a sudden it was a one score game at 20-14. After the touchdown, the Jaguars tried to do a short pop up kick, but it backfired on them. Falcons backup linebacker Austin Valdez returned the kick into South Alabama territory at the 47 yard line. Five plays later Greene scored his second touchdown of the day on a 17 yarder. That score extended the Falcons lead to 27-14 and they took that lead into the 4th quarter. The Jaguars started the 4th quarter scoring with an 18 yard pass from Bridge to junior tight end DeMarrion Buford-Hughes to cut the lead to 27-21. Late in the quarter, South Alabama was on the move again. With 4:13 left, they began a 73 yard drive that started with a 44 yard pass from Bridge to junior receiver Danny Woodson II. Seven plays later, junior running back Terrance Timmons ran it in from 3 yards out and the Jaguars had their first lead of the game at 28-27 with only 1:20 left. Just when it looked like South Alabama might win their first bowl game, Bowling Green let all the air out of their balloon. On the first play after the kickoff, Knapke dropped back to pass and lobbed a 78 yard touchdown pass to Roger Lewis to go back on top 33-28. Bowling Green attempted a two-point conversion, but it failed. Falcons corner Jude Adjei-Barimah sealed the win on the next play from scrimmage by intercepting Bridge and Bowling Green ran the clock out get the win. Here are my notes on the draft eligible players that played in the game. I will start with the winning team. Travis Greene, RB, RS Soph (5-10, 183): Tough player that was playing with a cast on his hand. Runs hard between the tackles. Has good leg drive and has the ability to push the pile. Has the ability to bounce off tacklers. Carried the ball 20 times for 41 yards and 2 TD. Had 2 catches for -3 yards. Converted a 4th and 1 situation. Ryan Burbrink, WR, RS Soph (5-8, 183): Small but quick. Nimble footwork. Runs nice routes and finds the soft spots in zone coverage. Makes people miss in space. Does a good job on underneath routes. Had 4 catches for 39 yards and attempted one pass that was incomplete. Heath Jackson, WR, Sr (6-1, 185): Nice moves in traffic. Good hands. Had 3 catches for 26 yards. Clay Rolf, TE, Sr (6-7, 275): Great size. Had a 26 yard kick return on a short kick. Charlie Walker, DE, Jr (6-3, 250): Good pass rusher. Quick off the ball. Has a good speed rush. Had 5 tackles, 1 tackle for loss and 1 sack. Bryan Thomas, DE, Jr (6-3, 248): Had a very disruptive game. Quick first step. Very good pass rusher. Good spin move. Sheds blockers quickly. Had 6 tackles, 2 tackles for loss, 2 sacks and 1 QB hurry. Kendall Montgomery, DE, Sr (6-6, 278): Great size. Strong at the point of attack. Good bull rush. Had 1 tackle and a fumble recovery in the red zone. Taylor Royster, DT, RS Soph (5-10, 255): Undersized defensive tackle with a low center of gravity. High motor. Relentless pass rusher. Had 3 tackles, 1 tackle for loss and 1 sack. Gabe Martin, MLB, Sr (6-2, 236): Has played both inside and outside. Led his team with 115 tackles this year. Good instincts. Flies to the ball. Had 5 tackles and 2 tackles for loss. Jude Adjei-Barimah, CB, Jr (5-11, 200): Physical cover corner. Great concentration and ball skills. Tackles well in space. Had 5 tackles, 1 pass breakup and 1 interception off a tipped ball. Called for a pass interference penalty. Rylan Ward, S, Jr (5-10, 195): Plays the ball well in the air. Good concentration. Had 4 tackles and an interception off a tipped ball. Brandon Bridge, QB, Sr (6-5, 235): Tall and lanky. Great size with a huge arm. Likes to attack deep. Good athleticism. Deceptively good runner. Has the strength to break tackles in the pocket and extend plays. Long strider. Sometimes falls in love too much with his arm. At times displays a lack of touch. Able to flick the ball downfield off his back foot. Good pocket presence. Had a horrible 1st half where his mechanics and footwork were completely out of whack, but adjusted at the half and had a much better 2nd half. Puts a lot of air on his deep throws. Throws well on the move. Had a 25 yard run and a 15 yard TD run. Completed 20 of 37 for 279 yards with 1 TD and 2 INT. Ran the ball 16 times for 41 yards. Kendall Houston, RB, Sr (5-10, 230): Team’s leading rusher in 2014 with over 700 yards. Big back. Patient runner that waits for his holes to develop. Nice cutback ability. Led the team with 53 yards rushing on 5 carries and had a 44 yard TD run. Terrance Timmons, RB, Jr (5-7, 180): Has speed to get to the corner. Runs hard and at times will take on tacklers despite his small size. Finds creases in the defense. Good receiver. Had 10 carries for 21 yards and a TD. Had 2 catches for 26 yards. Shavarez Smith, WR, Sr (6-1, 210): Led the team in catches, yards and TD for the year. Shows a lack of concentration. Dropped two certain TD passes. Follows blockers. Good on sweeps. Uses his body to shield off defenders. Had 4 catches for 34 yards. Danny Woodson II, WR, Jr (6-1, 200): Nice size. Runs good routes and makes acrobatic catches. Great hands. Great footwork along the sideline. Has the speed to stretch defenses. Has ability to climb the ladder and make catches above defenders. Led the team with 6 catches for 122 yards. Had catches for 44 and 45 yards. Chris May, RT, Jr (6-5, 290): Good movement skills. Threw a key block on 44 yard TD run. Theo Rich, DE, Sr (6-2, 260): Active defensive end that knows how to pressure the QB. Had 6 tackles, 1 tackle for loss and 1 QB hurry. Maleki Harris, OLB, Sr (6-1, 210): Vocal team leader. Undersized, but plays with heart. Runs well and always seems to be around the ball. A tough player that was shaken up early in the game, but returned. Had his best game of the year with 18 tackles, 3 tackles for loss, 1 sack and 1 QB hurry. Qudarius Ford, CB, Sr (5-9, 170): Big hitter. Good blitzer. Good open field tackler. Had 6 tackles, 1 tackle for loss and a sack/strip. Montell Garner, CB, Sr (6-1, 185): Struggles with technique and timing. Had 2 tackles, 1 pass breakup and was called for 2 pass interference penalties. Was beaten on 44 yard TD pass. Antonio Carter, CB, Jr (5-8,190): Lacks size, but is a competitor. Plays tight man coverage. Able to cover slot receivers. Had 4 tackles and 1 pass breakup in the end zone. Terrell Brigham, S, Sr (6-0, 195): Good blitzer. Big hitter. Plays better in the box. Isn’t great at one on one coverage. Had 12 tackles and was beaten on a 42 yard pass. Merry Christmas and see you next Wednesday! If you like what you read, like us on Facebook and tell your friends. This entry was posted on December 24, 2014 by draftmaniacs in Uncategorized and tagged 2015 NFL draft, Alabama, Antonio Carter, Austin Valdez, Birmingham, Bowling Green, Brandon Bridge, Bryan Thomas, Camellia Bowl, Charlie Walker, Chris May, Clay Rolf, Danny Woodson II, DeMarrio Buford-Hughes, Gabe Martin, Heath Jackson, James Knapke, Jude Adjei-Barimah, Kendall Houston, Kendall Montgomery, MAC Conference, Maleki Harris, Montell Garner, NFL, NFL Draft, Qudarius Ford, Roger Lewis, Ryan Burbrink, Rylan Ward, Shavarez Smith, South Alabama, Sun Belt Conference, Taylor Royster, Terrance Timmons, Terrell Brigham, Theo Rich, Travis Greene.